There once was a girl named Betty. Betty had a lot of interests; art, sewing, roller derby, teaching, and she also had a dream. 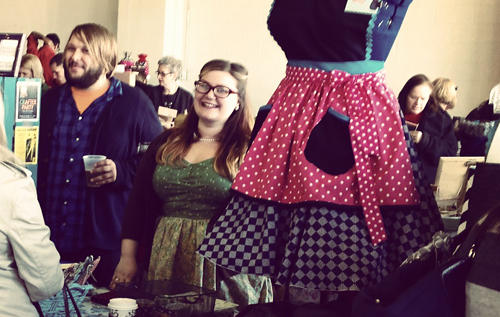 Betty dreamed of an alternative/indie craft fair… a “not your mother’s craft fair”… to happen in Toledo. So Betty got together with friends and fellow “extreme crafters”, reached out to the UpTown Association for their support, and started planning. And Maker’s Mart happened! It was a one-day shopping extravaganza of modern crafts, art, clothing, food, and all sorts of one-of-a-kind objects originating from Toledo. The event was packed with people shopping for unique, local gifts and enjoying the afternoon. While perusing the boatloads of awesome, D. and I rubbed elbows with so many of you! Betty deserves a big *high five* for making this event happen… and let’s hope it happens again soon.